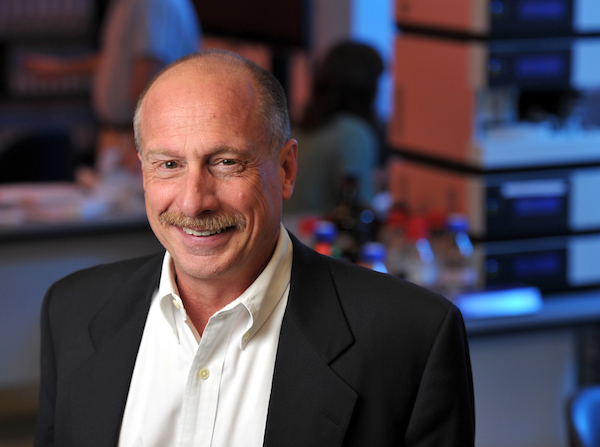 Norman Dovichi, Grace-Rupley Professor of Chemistry and Biochemistry, has been selected as the 2018 winner of the American Electrophoresis Society (AES) Lifetime Achievement Award. The award will be presented at SciX 2018 in October in Atlanta, Georgia. Dovichi, an affiliated member of Advanced Diagnostics and Therapeutics and program leader of Precision Medicine, is best-known for his role in developing and validating high-throughput DNA sequencers which helped enable the Human Genome Project. This contribution led the journal Science in 2001 to name Dovichi as one of the Human Genome Project’s unsung heroes. His group, now based in McCourtney Hall, was also the first to publish separations at the zepto- and yoctomolar levels, enabled by use of capillary electrophoresis coupled with laser-induced fluorescence for the detection of single molecules. Most recently, he has pioneered the study of vertebrate developmental proteomics. Dovichi’s use of iTRAQ labeling and mass spectrometry led to highly improved identification of sites, and with his collaborators, produced the largest developmental proteomic dataset published for any animal. Dovichi is the recipient of the 2013 ANACHEM Award, the 2012 RSC Robert Boyle Award, the 2007 Ralph Adams Award, and the 2003 ACS Award in Spectrochemical Analysis. He was also named to The Analytical Scientist’s 2017 Power List for his contributions to genomics research. He is a Fellow of the American Association for the Advancement of Science, the Royal Society of Chemistry, and the Canadian Institute of Chemistry. He holds over 15 patents and has published more than 290 peer-reviewed research papers in highly respected journals. Originally published by Rebecca Hicks at chemistry.nd.edu on March 15, 2018.